Welcome! 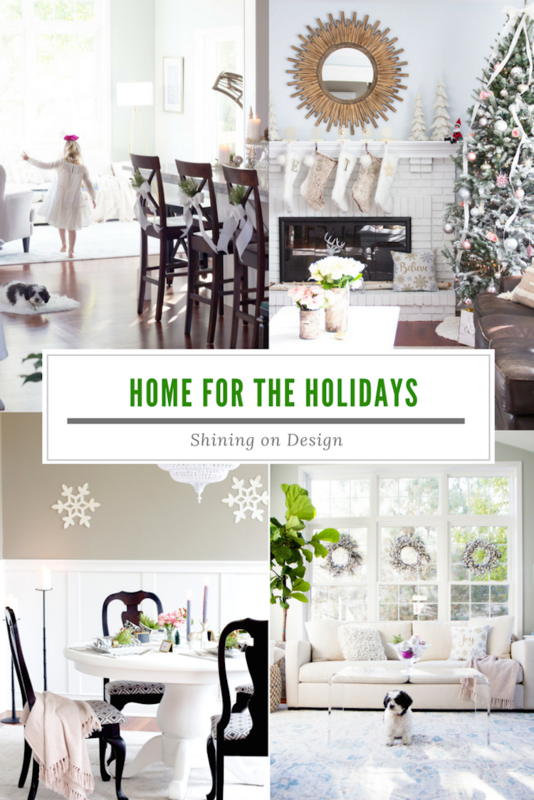 Thank you for joining us today as we share our home decked out for the holidays! 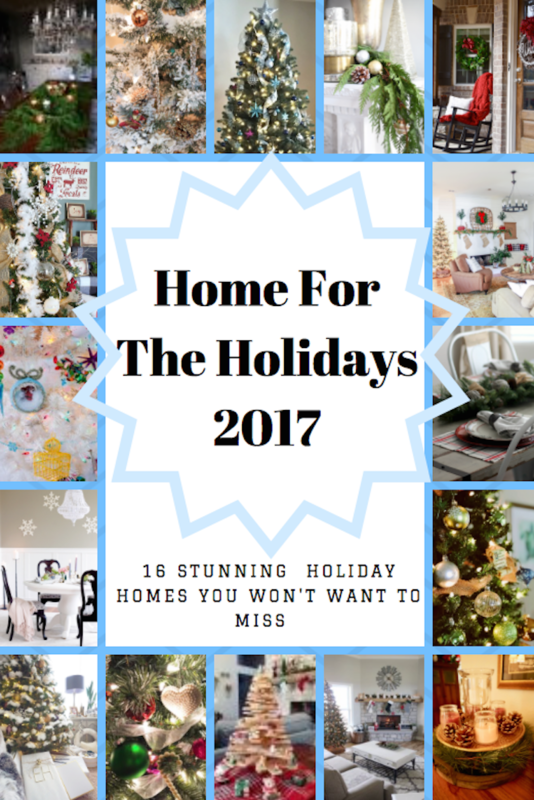 I’m honored to be a part of the Home for the Holidays blog hop this year with 15 incredibly talented bloggers. I’ve included all their links below too so be sure to check them out for more inspiration. 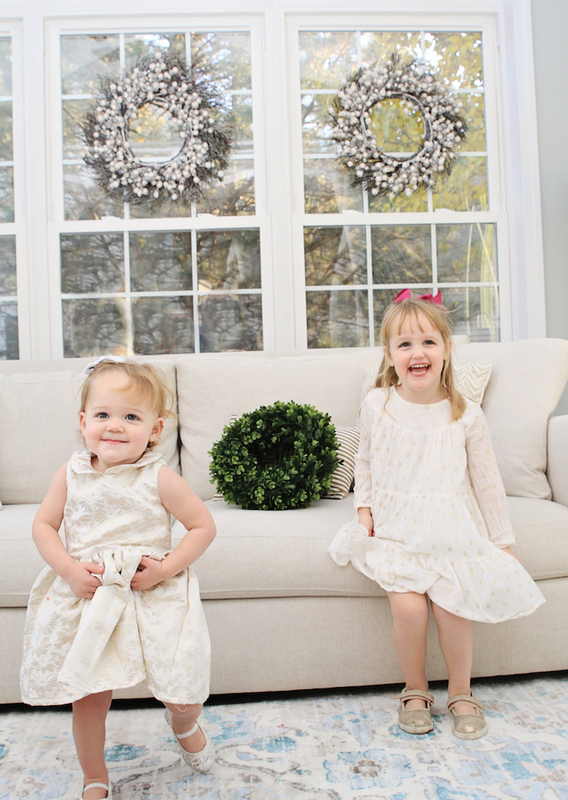 Decorating this year was extra special for a few reasons.…. First, this is our first holiday in our new home. Second, this my very first home tour. Third, we are HOSTING Christmas this year for the first time!! A lot of FIRSTS 🙂 But no pressure, right? 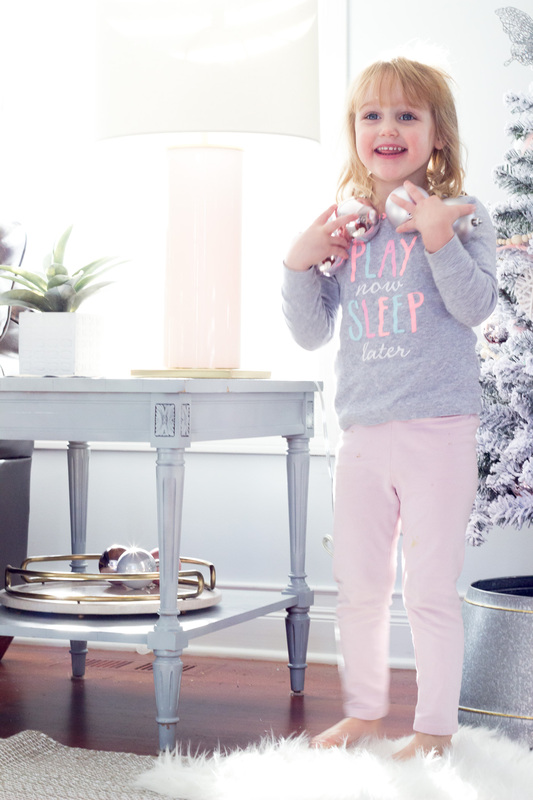 I wanted our decor to be pretty, festive, and kid-friendly – but not tooo kid-friendly 😉 Seeing the girls’ eyes light up every time a new Christmas decoration was added truly made me so happy… so much that I had to keep the decorations under control! The holidays have definitely become more fun with the little ones. So, let’s get started with the dining room………..
You see our dining room when you first walk in our front door. It’s probably our least used room in the house, but it is one of my favorite rooms. Our table was a thrifted find (for $12.99!). I loved the shape and knew it would be perfect with a little paint! Isn’t it amazing how paint can transform a piece? 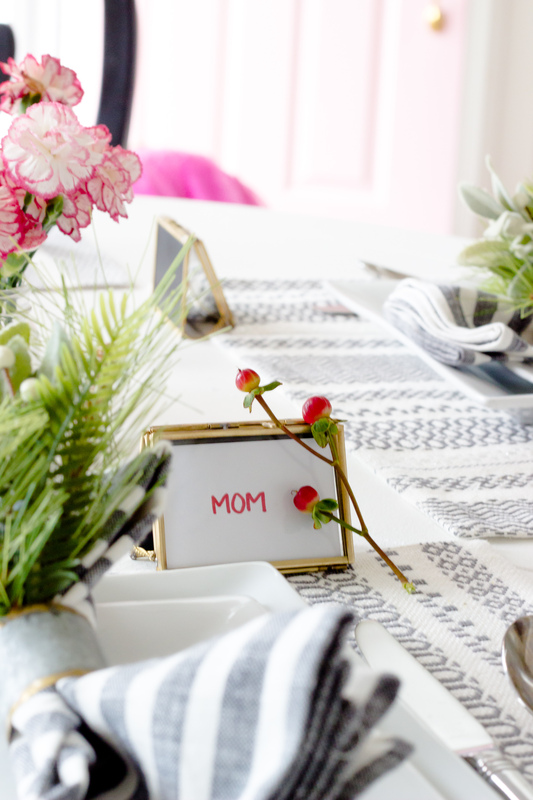 I usually keep my tablescapes pretty minimal since food and company are really the highlight of any meal around the table. 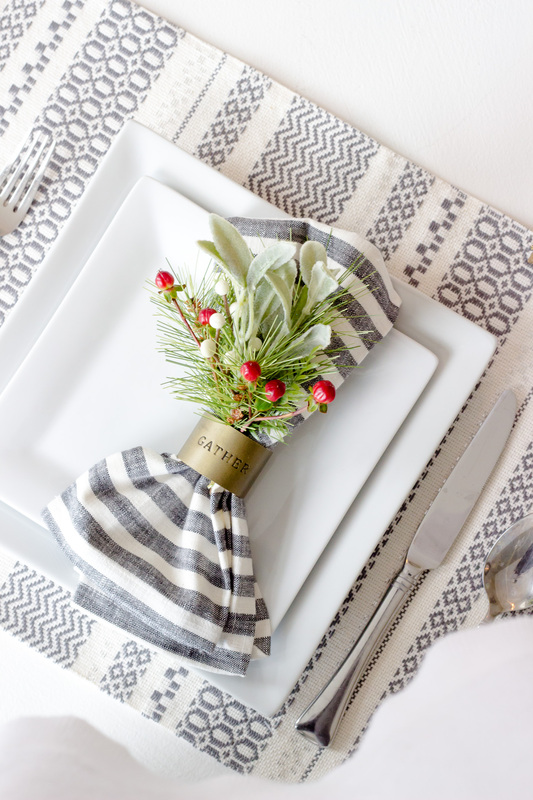 I love these striped napkins, napkin rings. 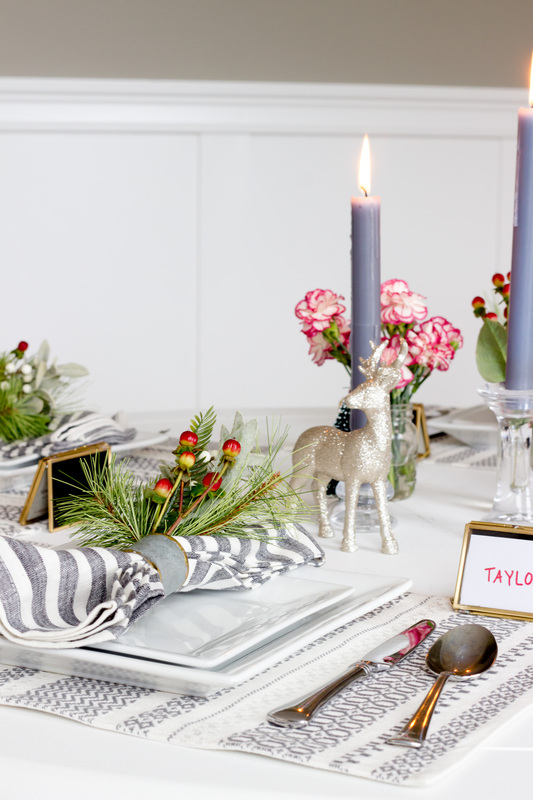 place card holders, spruce – all from Magnolia’s Hearth & Hand line at Target. Did anyone else splurge when these items were released?? I also included a few smaller pieces (flowers, candles, etc.) in the center that can easily be moved to make room for food, wine, etc. These laser cut wooden snowflakes on our walls are pretty and whimsical – which is exactly what I want Christmas to feel like this year. I keep changing my mind about artwork for this room and now am leaning towards wallpaper. We have quite a few projects that will take priority but these snowflakes are perfect to fill the space for now! 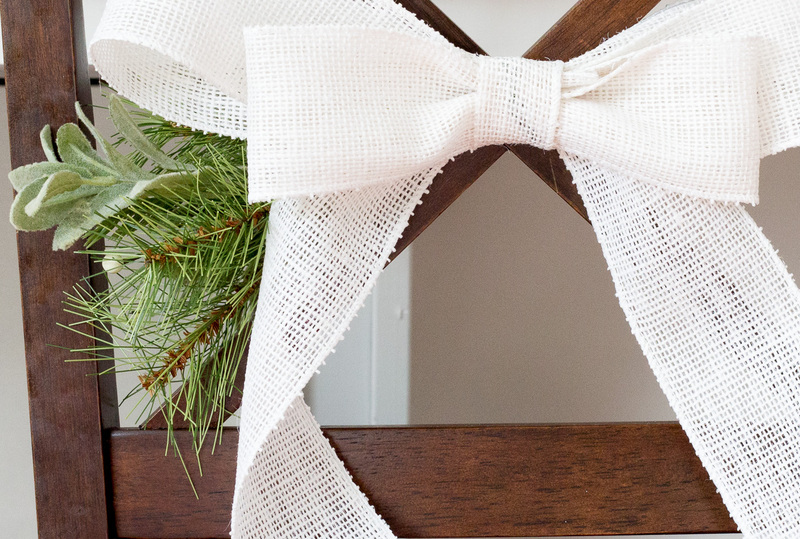 Simple wreaths are definitely trending in holiday decor this year. I was thrilled when I found this Juniper wreath for our front door. A little fishing line did the trick to hang it – works like a charm and you can’t even see it! Our living room has TWO trees this year. One small faux tree for the kids (which was only $30 and so easy to put together). Plus, our real tree which we flocked again this year. 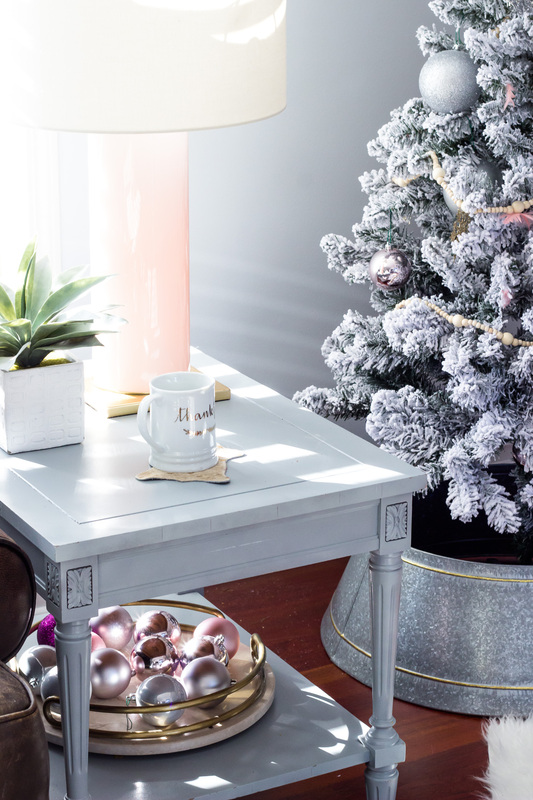 I wrote a post about how we flocked our real tree last year and I highly recommend giving it a try if you like the look. 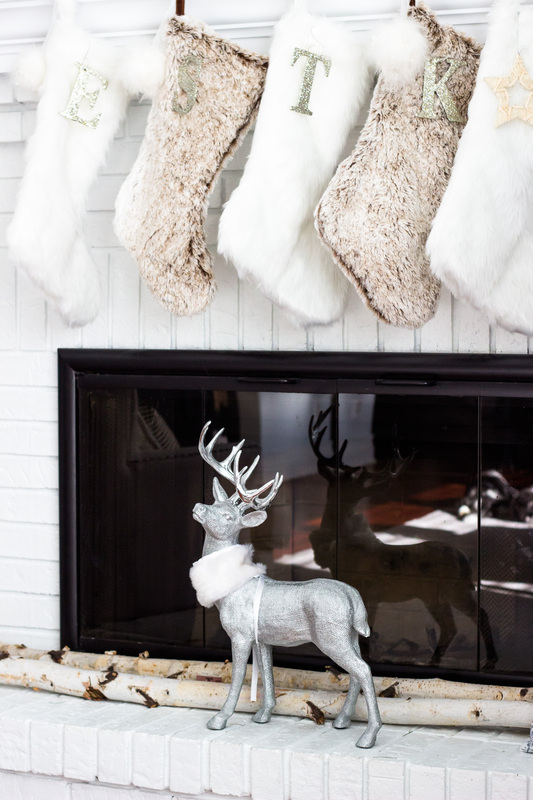 It’s really easy to do and to my surprise, Eric even took the reigns on this DIY this year. 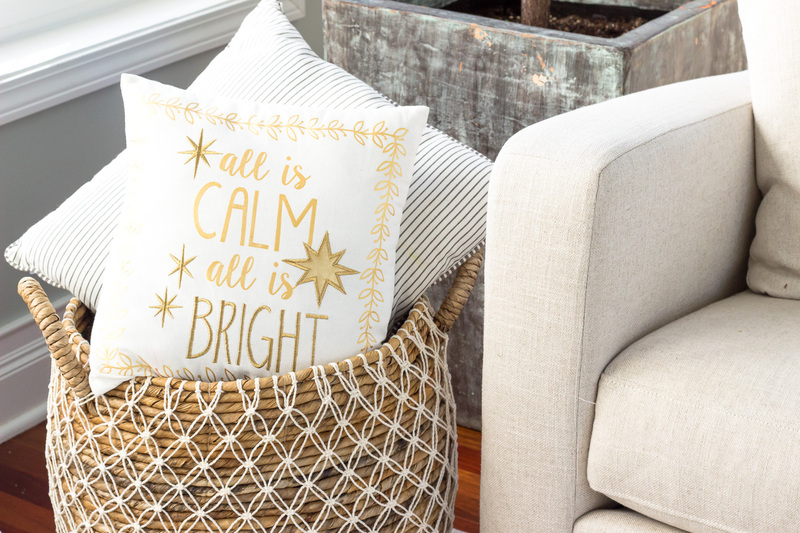 Looking for a SUPER easy decorating idea? 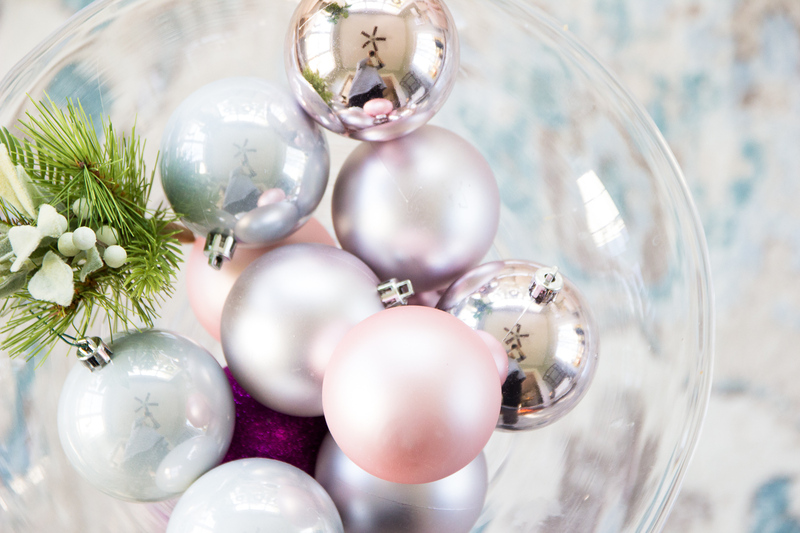 Fill trays and bowls with extra ornaments – only the UNBREAKABLE ornaments for us!! I also added a little spruce to our vase in our sunroom too (pictures below). 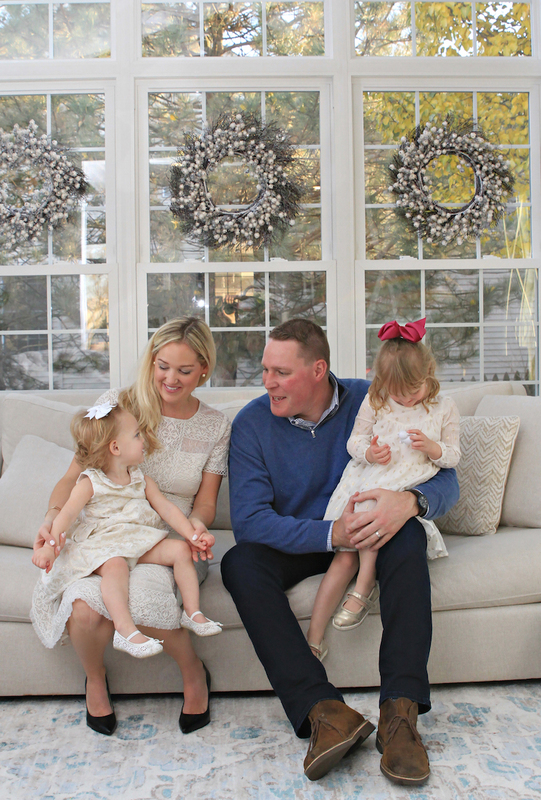 The kitchen, living and sunroom are the three places where we spend the most time together. This is what sold us on the house actually! The open concept is HUGE when it comes to entertaining or just being at home with kids. 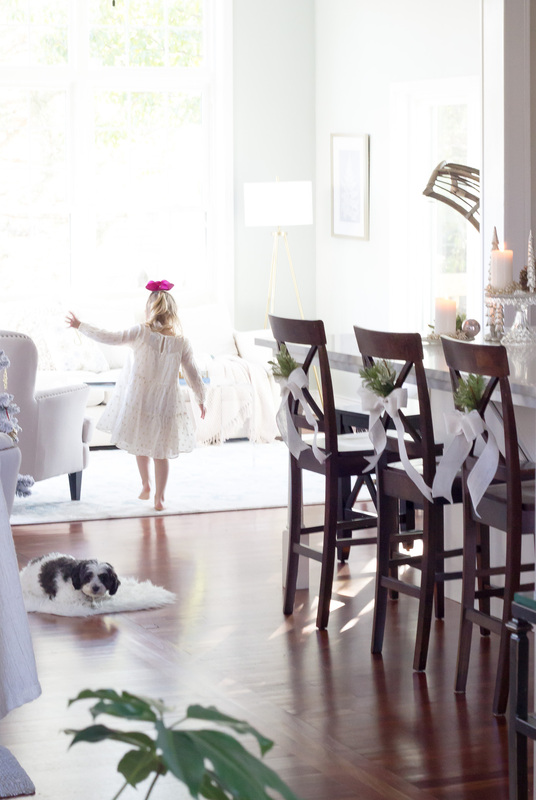 I can keep a close eye on the kiddos while they play and our kitchen island has become a perfect gathering spot for friends and family. These bows were much easier to make than I thought. I made each one using this video tutorial and I could have easily gone overboard. I even went back to Hobby Lobby TWICE for more ribbon. Finally cut myself off after making three bows for the chairs, one for our tree topper and another for our stairs :). Next up, our SUNROOM. My favorite room in the house! Since it has been cold out lately, this room has gotten a lot more use. It’s our go to spot for reading, snuggling, talking, coloring, working, pretty much everything! Thank you so much for stopping by! I’ll continue to post more decorations and inspirations on social media so be sure to follow along on INSTAGRAM and PINTEREST too! I wish you and your family a very happy holiday!!! 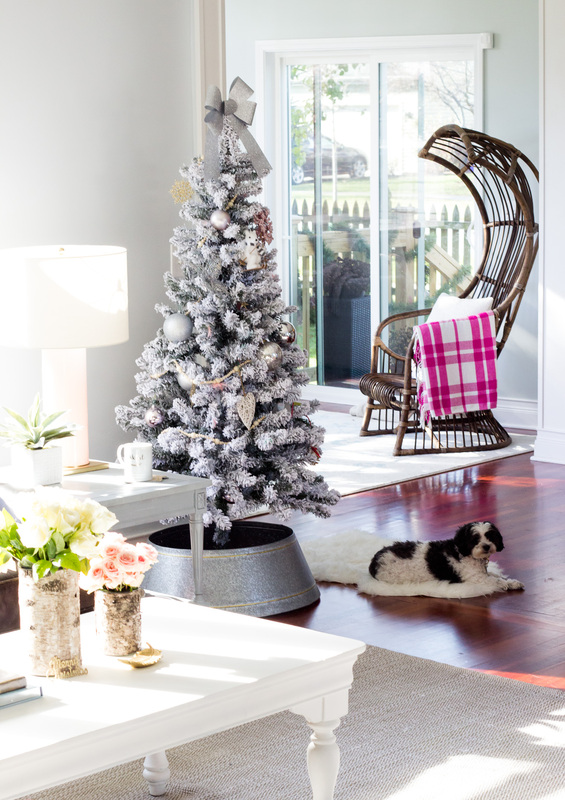 See the links below for more holiday home inspiration from some very talented bloggers! 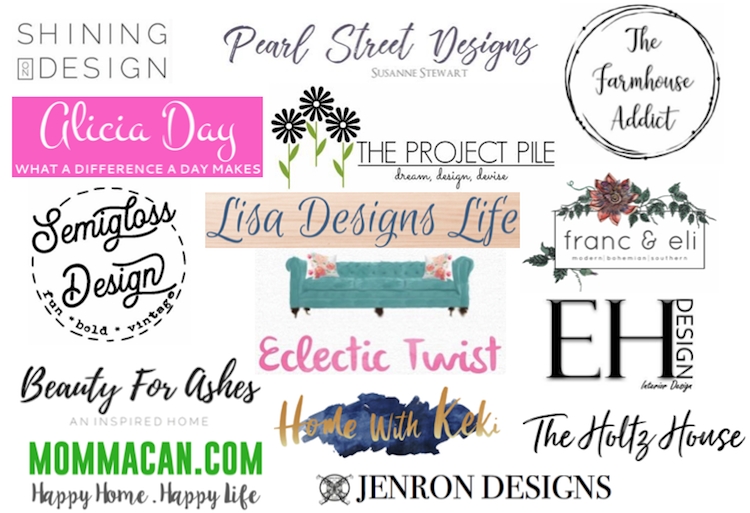 Thank you to Jen of Jenron Designs for organizing this blog hop! Samantha your home is gorgeous!! 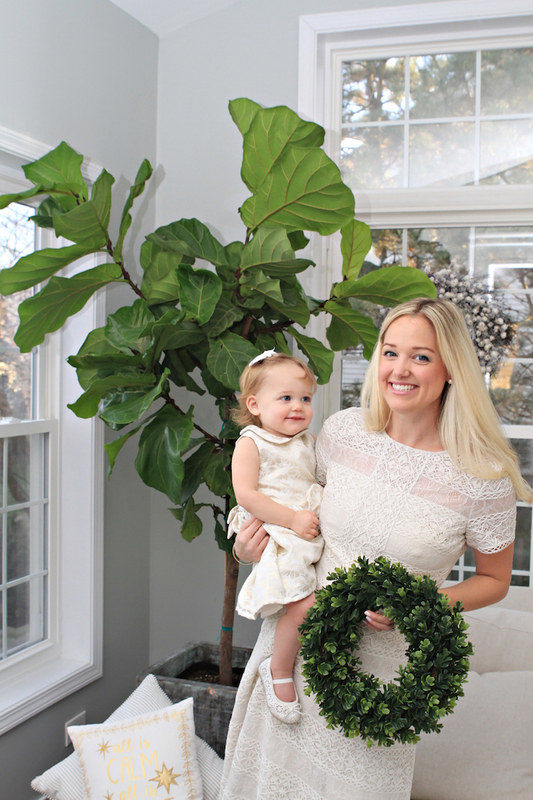 I would have never guessed this was your first home tour….you did an amazing job!! I am so glad I got to meet you and join in this tour with you! Thank you Susanne!! That is so sweet of you to say 🙂 Great meeting you as well and your home tour is beautiful!! Saving ideas for next year! 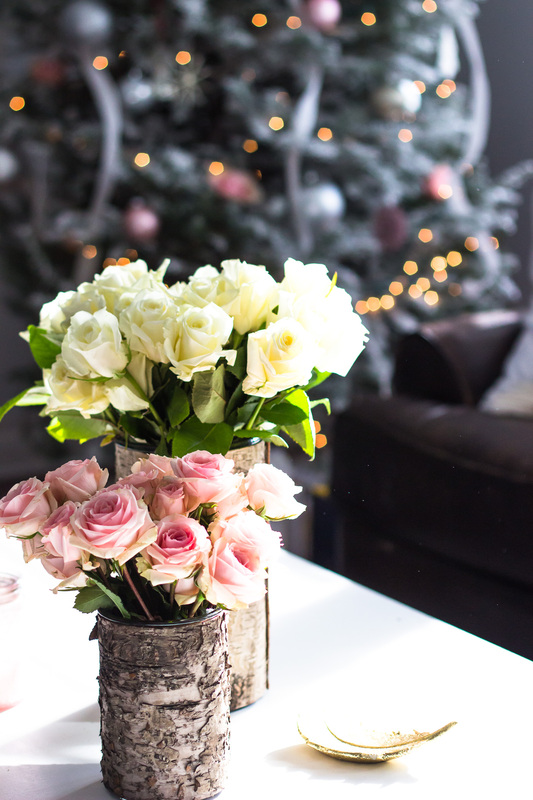 Samantha, your home is absolutely beautiful for the holiday. You carry a very chic and elegant vibe that I am sure everyone is going to love. I know I do!!! 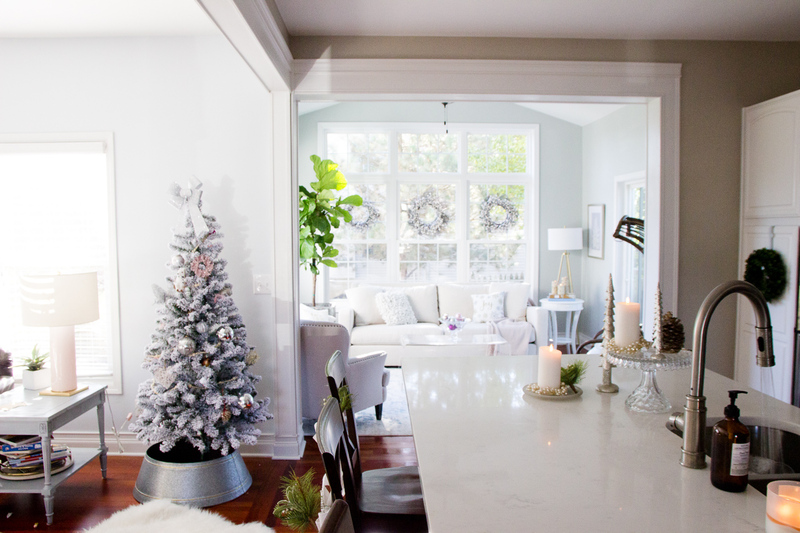 Thank you for joining us on the home tour, it was my first Christmas home tour too! I think we all knocked it out of the park!!! Jen you are the sweetest!! THANK YOU!! I know it was hard work to put everything together too so thank you again! Your home is gorgeous! I love the pink door! 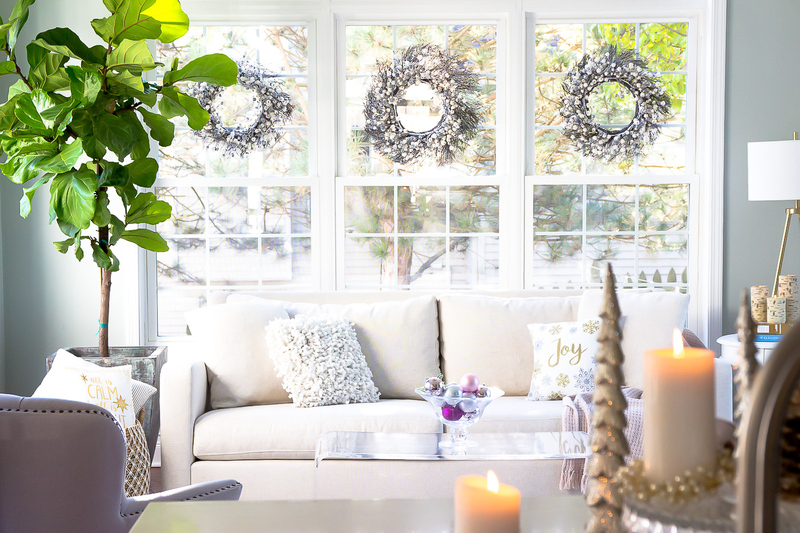 The wreaths on your windows are so lovely! Samantha this is stunning! I love your little dog, so cute! And if your dining table is ever missing you know where to find it! Everything looks so pretty and I love how the home flows so nicely. Well done! Hahaha it was a great find!! Maybe my best to date. Thank you for your sweet compliments!!! I LOVED your home tour too! Thank you dear! We only planned on having the one but I love how BOTH look downstairs so we left them : ) . Having 2 girls lets me get away with a lot of pink these days!! It looks beautiful! I am looking forward to seeing it all in person while we enjoy our holiday time together! Thank you Josie!! We can’t WAIT to have you for Christmas!!! Wow beautiful job! 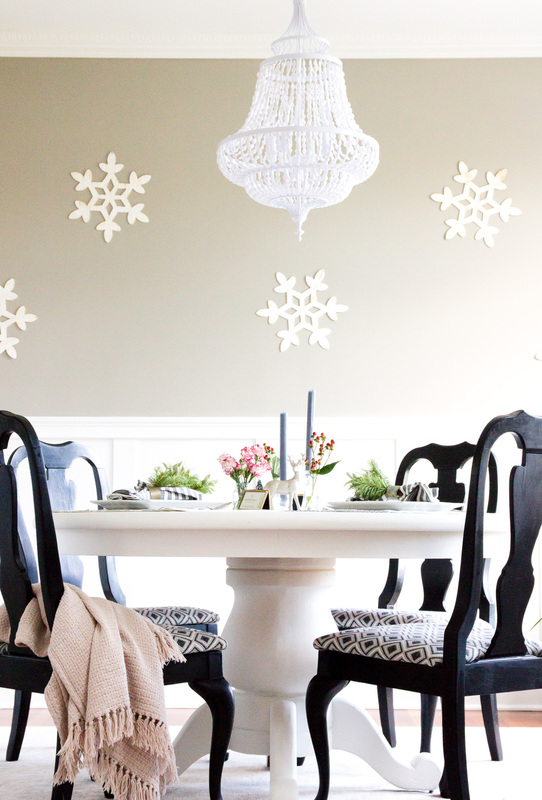 The snowflakes on the walls in the dining room were a perfect touch for the walls! And an extra Merry Christmas for your first holiday in your new home! Thank you TIna! I was a little nervous about putting them up at first but glad I went for it. Merry Christmas to you too!! Your home is absolutely stunning, Samantha! It’s so elegant and beautifully styled. 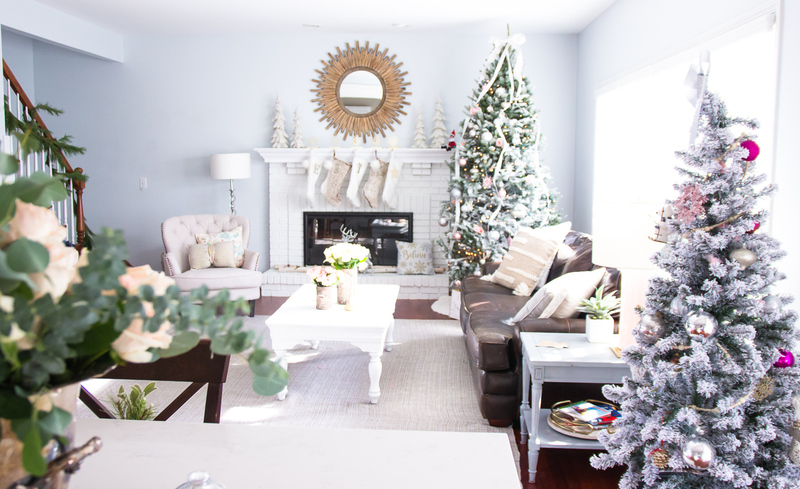 I love all the light colors you used in your Christmas decor! And your photos are magazine worthy (I need some photography tips ;)). Thank you Heather!! That is the sweestest compliment 🙂 Your photos are amazing but I appreciate it! Thank you Kari! Your photography is amazing. And I loved your hot chocolate bar post!!! Definitely using that idea for Christmas this year! Aw thank you Sarah!! I really, really appreciate your sweet words!! Happy Holidays! Everything is so lovely here. 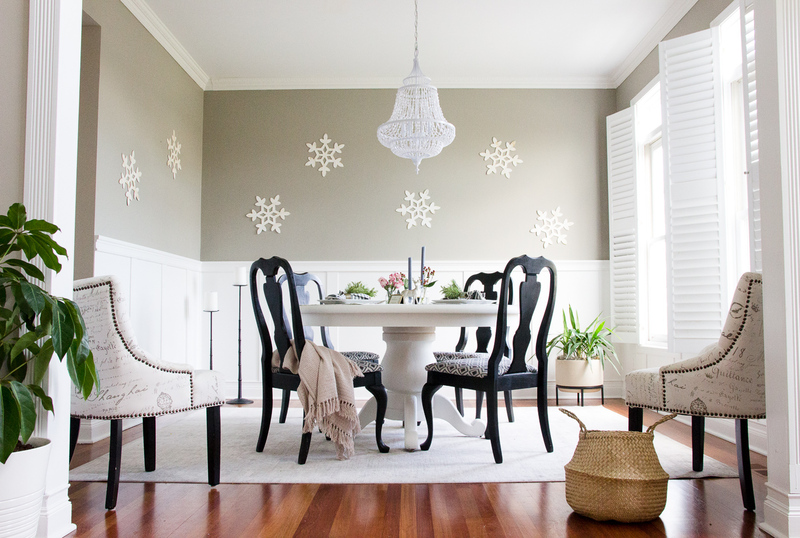 I fell in love with your whimsical dining room snowflakes. And that table! What a find! 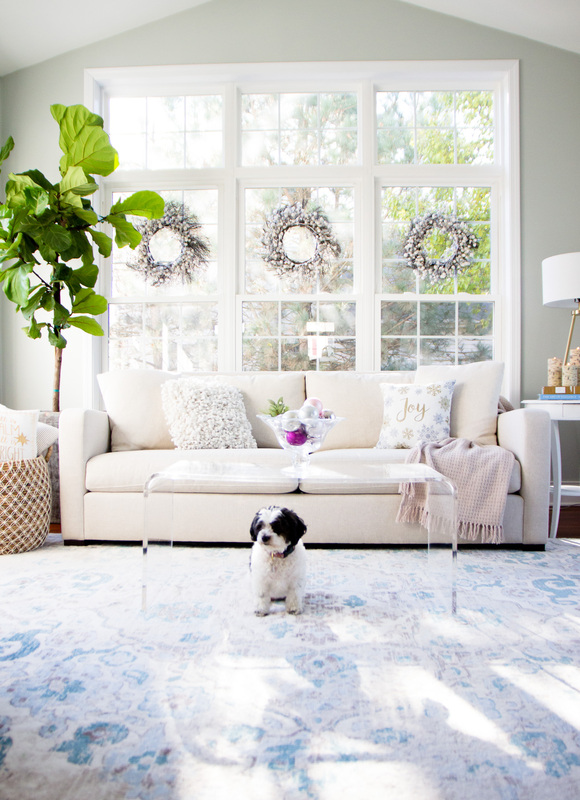 Love the natural light in that room and your decor is so gorgeous there. 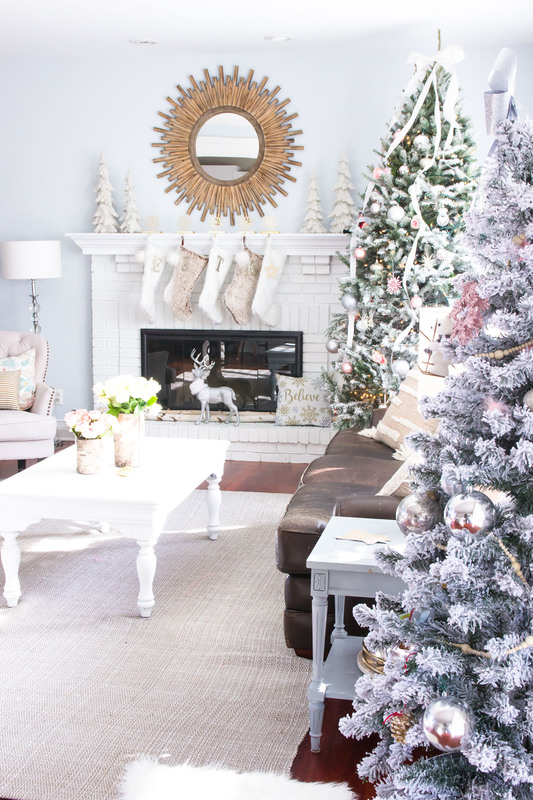 I have never flocked a tree, but after seeing your beauties, I must try it! The way that you incorporated so many textures in that room is brilliant. 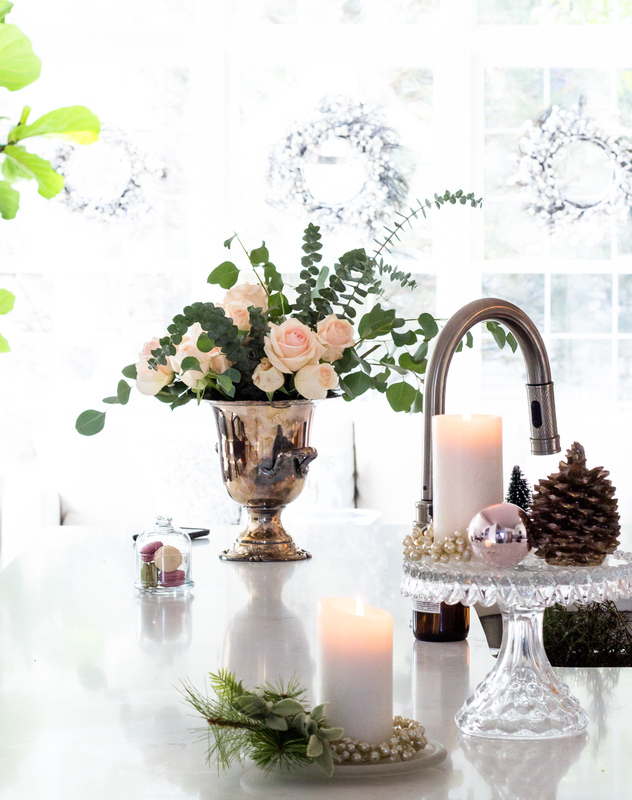 I love the furry stockings on the mantle, the glass ornaments in shiny bowls, and those candles wrapped in spruce. I think that your favorite room is mine also. 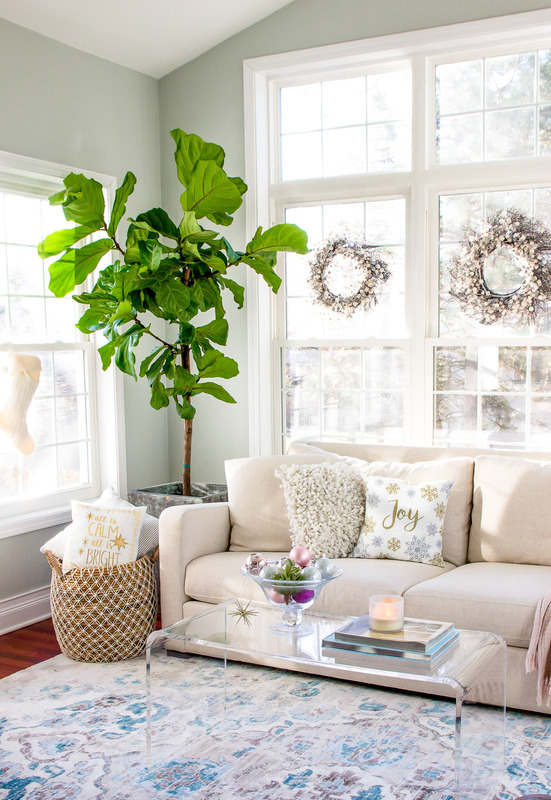 The sunroom is perfect for snuggling or reading a book over the holidays. Thanks so much for inviting us into your home! Merry Christmas! You have to let me know if you do try the sno flock Alicia! Thank you so much for all your kind comments. I truly appreciate it coming from you!! Merry Christmas! Your home is beautiful, love the soft pinks and I would hang out in a sunroom too if I had one. 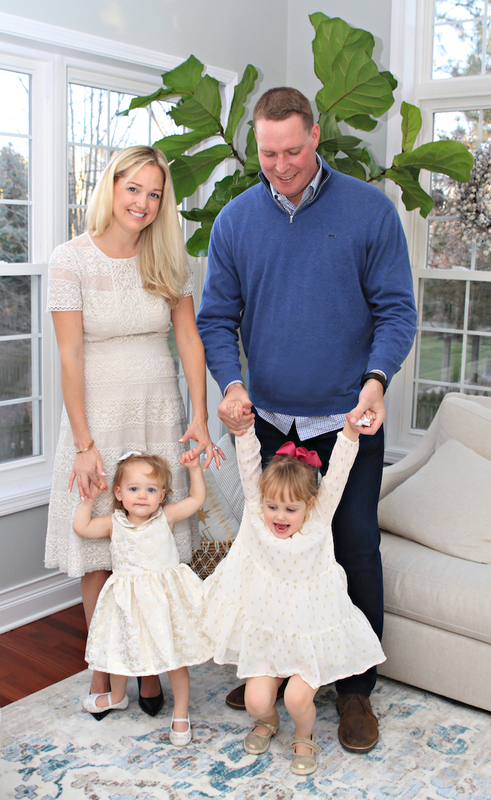 Loved the pics with your children and pup, sweet! I still have not tried the flocked tree but wow, yours is stunning. 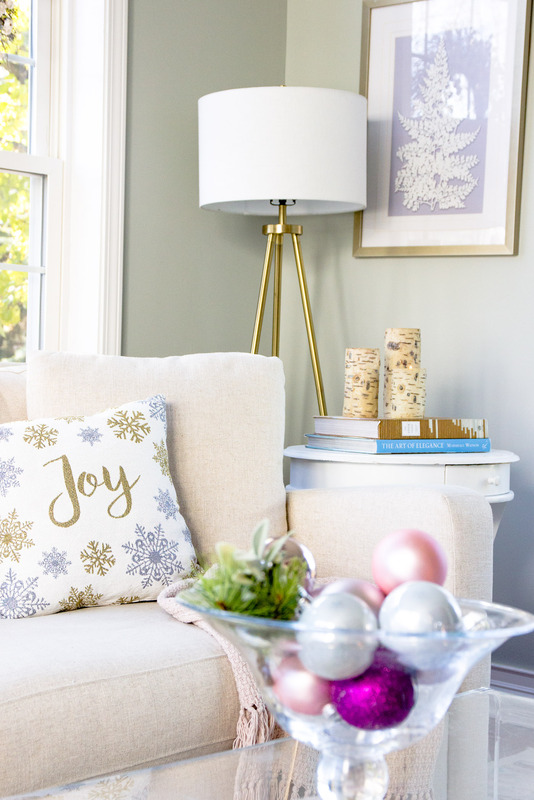 The snowflakes are the perfect wall art for the holiday season, love all your ideas. 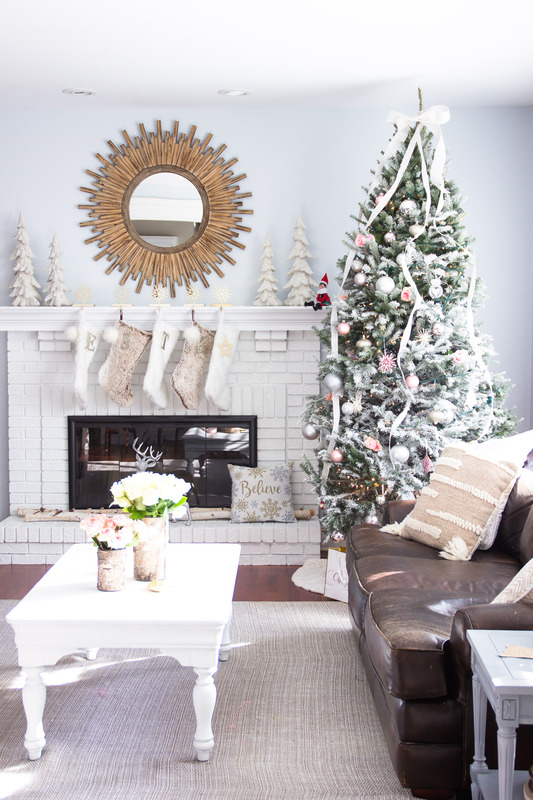 Beautiful Christmas home tour! 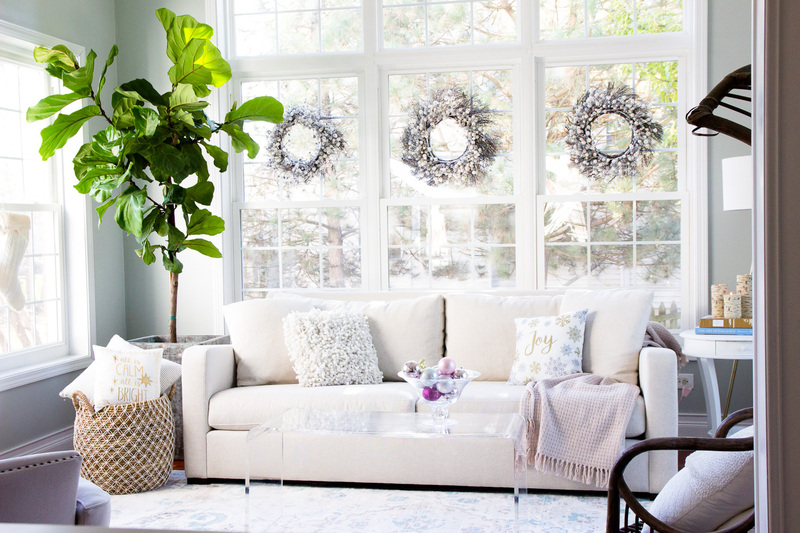 I can see why you love that sun room and those wreaths are gorgeous! Loving the snowflakes too – great idea!!! Thank you SO much Tana for your kind words!! That means so much coming from you. Happy holidays dear!